To celebrate Rohan Dennis's win and Joey Rosskopf's second place in yesterday's time trial my team-mates and I had a glass of wine with last night's dinner and I made sure to leave the room for our traditional victory treat of tiramisu. Last night felt a bit like a goodbye for some of the guys as one of our osteopaths, a masseur and one of the coaches left the race, as did Rohan who is skipping the last days in the mountains to prepare for the world time trial championships at the end of the month. Afterwards, a visit from a friend from Bilbao boosted my morale with a chat at the bar and a packet of my favourite pata negra ham to get me through the next few days. Fatigue from yesterday's time trial meant I opted out of the team's plans to get men up the road in the early breakaway this morning. Although there were some brief flat spots on today's route profile, they were few and far between and we had 4,000m of climbing en route to another mountain-top finish at the Balcon de Bizkaia, so I knew that if I didn't give myself an easier day I'd be in no fit state to try and make the breakaways in the coming days. Once again, the move of the day went on the first third-category climb of the day, after about 10km, with both Dylan Teuns and 'Demma' (Alessandro De Marchi) making it into the big 26-man move. Strangely, the local Euskadi team spent a lot of the day on the front - even though they had a man in the break. I'm not sure if it was for TV publicity in their local region or what but when Astana stepped on the gas with about 40km to go they blew them away and they all got dropped. Once the break went this morning, it became apparent how tired the rest of the peloton are after two and a half weeks of racing. For me, there's no point in fighting to finish in the top 30 or 40 overall when people barely remember my fifth place overall here in 2013. Today the bunch was split into three types of rider; those who were in the breakaway and racing for the stage win, those who were racing for overall glory or had to help their team leader race for overall glory at the head of the peloton, and then the rest of us, who were thinking of another day and just wanted to get to the finish by expending as little energy as possible so that we can have a go again. With two more mountain stages to come, I knew this morning which group I was going to be in and rode up alongside world champion Peter Sagan. "Hey, Peter, today I'm in the grupetto. When's it going to go?" The grupetto is a big group of riders, usually led by one of the experienced sprinters who ease up early on a mountain stage and just concentrate on getting to the finish together and within the time limit. I didn't want to sit up too early today because the thing about the grupetto is that their pace never seems to be the right one for me on the climbs, so with about 30km to go I settled into a group of about eight riders, all of whom were under no pressure or stress to get to the summit of the last climb. Once again I had a 36x30 gearing on so while the rutted concrete-paved climb was very steep and narrow, and was still a grind to get up, it didn't feel as hard as some of the mountains we tackled last week. By the time my group hit the final slope, Dylan was almost 20 minutes further up the mountain and pulling clear on his own in the last kilometre. 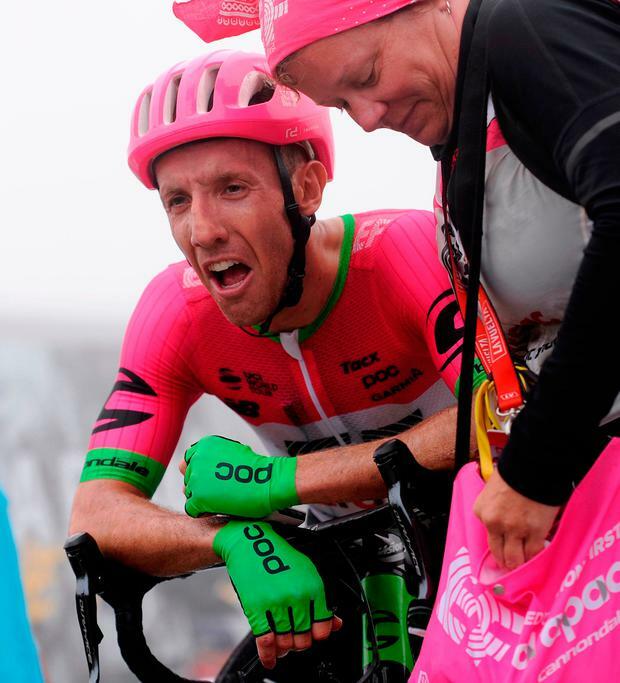 Unfortunately for my room-mate, he was caught and passed by American Michael Woods of Education-First Drapac in the last 500m and he had to settle for second on the stage. Dylan has had a fantastic Vuelta so far and in his last four attempts he has finished fifth, fourth, third and second. Maybe he just needs one more breakaway to get the full set. Understandably, he was very disappointed when he got back to the bus but he can be proud of his Vuelta and his consistency means he is now second behind Alejandro Valverde in the points classification. The Basque fans today were amazing on the final ascent but I'm always amazed at how there is no other evacuation plan off the mountain other than us riders having to slalom through hordes of men, women and children on a dangerous, twisting 10km descent on rutted concrete roads, to get back to the team buses. To celebrate my safe arrival onto the coach, I opened up my packet of ham and shared it with Fran Ventoso over a bottle of sparkling water.